ROBOT PROBE PHILAE uploaded a slew of last-minute data to Earth yesterday from a comet in deep space, before going to sleep at the end of its historic mission, ground controllers said. Data streamed in as soon as Europe’s pioneering robot lab re-established late-night contact with its orbiting mother ship, Rosetta, but its limited battery soon started wavering. “My #lifeonacomet has just begun,” said an official tweet in the name of the washing machine-sized lander perched on comet 67P/Churyumov-Gerasimenko since Wednesday — concluding with a restful “zzzzz”. The European Space Agency (ESA) said its robot lab had entered “idle mode”, with all instruments and most systems shut down after three days of non-stop work — taking pictures and probing the comet’s density, temperature, composition and atmosphere. “Prior to falling silent, the lander was able to transmit all science data gathered,” said a statement. The lander and its mothership, which relayed Philae’s data to Earth, had only two communications windows per day — the last opened around 2130 GMT yesterday and closed at 0036 GMT the next morning as Rosetta disappeared in orbit behind the comet. Mission controllers had feared the robot may not even have enough power to make contact during this window — but they were pleasantly surprised. The channel should open again around 1000 GMT Saturday, but lander manager Stephan Ulamec told AFP from mission control in Darmstadt, Germany, he did “not really expect” contact with Philae then. “The chances that we could reestablish the link again tomorrow are really very, very low,” he said. “The battery is not completely empty, but it is below the level the central computer needs to boot” up. In one of many jaw-dropping achievements, the robot lab appears to have lifted itself slightly yesterday and rotate the larger of its solar panels to absorb as much energy as possible to be stored for a possible wakeup later. Philae had landed in a dark ditch after a bouncy touchdown Wednesday, and did not get enough sunlight to recharge its batteries sufficiently to extend its mission. 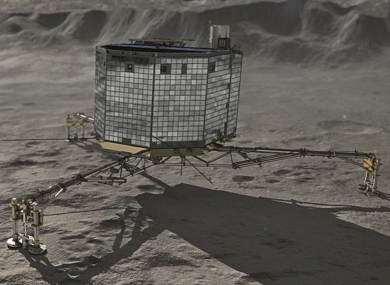 Mission engineers dream, however, of making contact with the lander “at some point” in the coming months as the comet, with Philae hopefully still clinging to its surface, moves closer to the Sun. Philae’s historic on-site survey of a comet travelling at 18 kilometres (11 miles) per second, currently at a distance of 510 million kilometres (320 million miles) from Earth, is the highlight in a more than decade-long mission. Philae landed Wednesday after a nail-biting seven-hour, 20-km descent from Rosetta, which had travelled more than a decade and 6.5 billion kilometres (four billion miles) to meet up with the comet in August this year. The touchdown did not go entirely as planned, when Philae’s duo of anchoring harpoons failed to deploy and it lifted off again… twice. The ESA confirmed that Philae had drilled Friday, though it did not specify whether a sample had been obtained. The Rosetta-Philae team said Friday they were ecstatic with the results. “We’re in the middle of drinking champagne because this mission is a success,” Philippe Gaudon, the head of the Rosetta project at France’s space studies centre CNES, told AFP early this morning. All 10 instruments on board the 100-kilogramme (22-pound) lab had kicked into action. “This machine performed magnificently under tough conditions, and we can be fully proud of the incredible scientific success Philae has delivered,” said Ulamec. The €1.3-billion mission aims to unlock the secrets of comets, which some astrophysicists believe may have “seeded” Earth with some of the ingredients for life. Email “Philae probe has fallen asleep after its batteries ran out ”. Feedback on “Philae probe has fallen asleep after its batteries ran out ”.